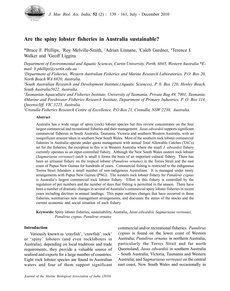 Australia has a wide range of spiny (rock) lobster species but this review concentrates on the four largest commercial and recreational fisheries and their management. Jasus edwardsii supports significant commercial fisheries in South Australia, Tasmania, Victoria and southern Western Australia, with an insignificant amount taken in southern New South Wales. Most of the southern rock lobster commercial fisheries in Australia operate under quota management with annual Total Allowable Catches (TACs)set for the fisheries; the exception to this is in Western Australia where the small J. edwardsii fishery currently operates as an input-controlled fishery. Although the New South Wales eastern rock lobster(Sagmariasus verreauxi) catch is small it forms the basis of an important cultural fishery. There has been an artisanal fishery on the tropical lobster (Panulirus ornatus) in the Torres Strait and the east coast of Papua New Guinea for hundreds of years. Commercial fishing is restricted to the indigenous Torres Strait Islanders a small number of non-indigenous Australians. It is managed under treaty arrangements with Papua New Guinea (PNG). The western rock lobster fishery for Panulirus cygnus is Australia’s largest commercial rock lobster fishery. Effort in this fishery is controlled by the regulation of pot numbers and the number of days that fishing is permitted in the season. There have been a number of dramatic changes in several of Australia’s commercial spiny lobster fisheries in recent years including declines in annual landings. This paper outlines changes that have occurred in these fisheries, summarises new management arrangements, and discusses the status of the stocks and the current economic and social situation of each fishery.